London can be a lonely place particularly if you have a disability, a long-term health problem or are an older member of the community. Community gardening enables you to meet people, make friends and therefore reduce the risk of becoming lonely and socially isolated. Our gardeners mainly live in Hackney or our neighbouring boroughs of Tower Hamlets, Islington and Camden – some of the most disadvantaged boroughs of London. Many of them have long and enduring support needs such as learning disabilities, sensory impairments, physical disabilities, long term mental health issues, cognitive impairments through head injuries or associated with HIV infections. Gardening provides an excellent and adaptable medium to work with people to increase physical stamina, increase resilience and in particular develop strength. Over 50% of our gardeners are from black and other ethnic minority groups. Our youngest gardener has been 20 months old and our oldest gardener is currently 88yrs old. We had a wonderful poet-in-residence around the time of the Open Garden Squares weekend in 2015. 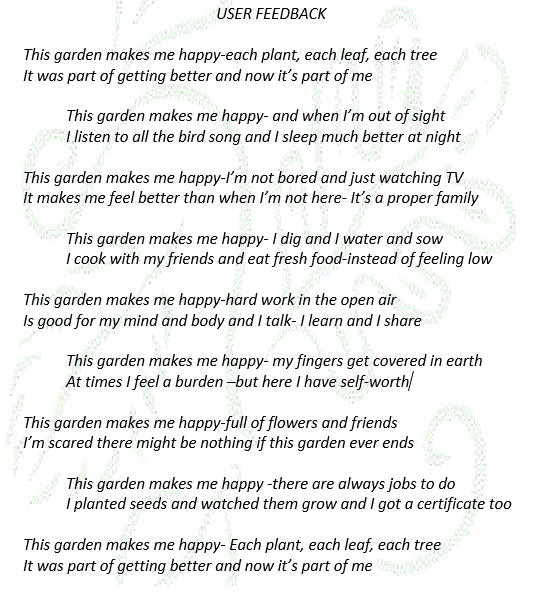 Mary Dickins listened to our gardeners over several days, and distilled their feelings into a moving and inspiring poem: User Feedback ©Mary Dickins, 2015. Download the poem as a pdf file if you would like to have a copy.